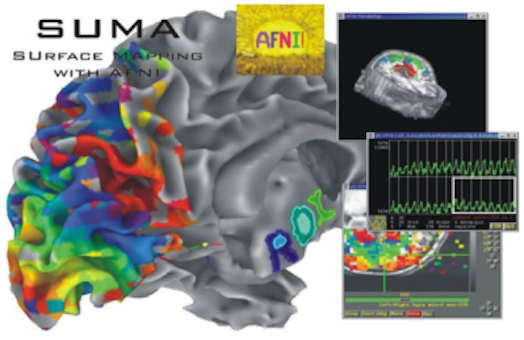 SUMA is a program that adds cortical surface based functional imaging analysis to the AFNI suite of programs. It allows viewing 3D cortical surface models, and mapping volumetric data onto them. With SUMA, AFNI can simultaneously and in real-time render Functional Imaging data in 4 modes: Slice, Graph (time series), Volume and Surface with direct links between them. Source Code (right click --> save as) - The SUMA source code is distributed with AFNI. Demos from class material (right click --> save as). You might want to download the entire bootcamp set. Install - Installation Documentation for AFNI and bootcamp material. Bootcamp slides to go with demo from class material. See also FATCAT related material here. Slides from AFNI BootCamp are available here. Slides (pdf and ppt) from SUMA hands-on class.